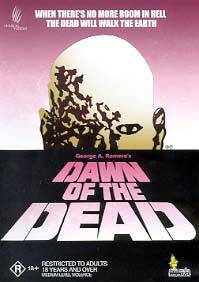 In 1978, a decade after Romero's classic zombie benchmark Night Of The Living Dead, he resurrected his theme on a much larger scale and in vivid colour. With Italian horror director Dario Argento as co-producer, Romero set the bulk of his action in a shopping mall (which was quite a new thing at that time). A group of people, including two SWAT team members makes a run for it with a helicopter as the (again inexplicable) zombie epidemic spreads like wildfire. Romero again favoured a black actor and blonde female as leads. This group holes up in a mall where they can sustain themselves for a very longtime. But slowly their idyllic sure-thing starts to fall apart. As you should know, if you're bitten by a zombie it isn't long before you turn into one yourself, with a craving for human flesh. The scale of the doomsday mood and atmosphere of chaos coupled with action and graphic horror (courtesy of Tom Savini) has a great combining effect of adrenaline, tension, scares, gross-out and a bit of social commentary (Romero's subtext of runaway consumerism being an apt analogical device in the guise of flesh eating freaks). Argento's collaborative soundtrack creators The Goblins provided the fantastic music. This DVD release includes a commentary track by Romero and producer Richard P. Rubinstein, a 75-minute docy on the movie, biogs, trailers, radio spots and a photo gallery. This is a classic shocker that got a remake in 2004.